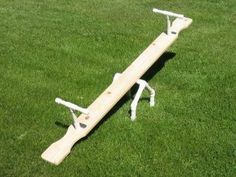 To better understand Romans 12:3, I imagine a teeter totter. If we think of ourselves more highly than we ought, we hit ground hard on one end. If we lack self-respect and don’t think of ourselves as highly as we ought, we hit ground just as hard on the other end. With God’s help, as we find our correct balance, whatever is in our lives that applied weight to either end shows up like never before. If those weights won’t allow us to obey God and assume our rightful new balance, they will have to go. At the very least, they must keep a respectful distance so we can teeter totter like we ought! Balance. God, help us find it, and maintain it all the years of our lives. This entry was posted in Uncategorized and tagged Do not think of yourself more highly than you ought, Romans 12:3, Think of yourself as highly as you ought..